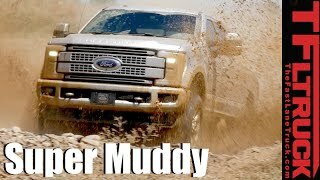 It has been around two decades that the Ford’s truck segment has been lead by the Super Duty and since then they have been doing pretty well in bringing something new for their buyers. 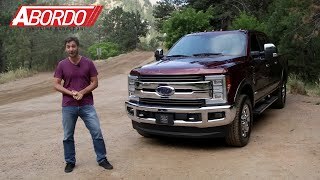 In lieu to same they recently shared the all new Ford F Series Super Duty 2017. Being created over high-strength steel-frame the truck offers numerous electronic systems and safety materials. 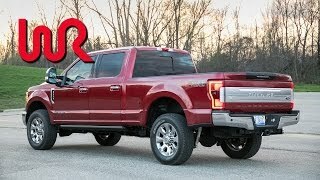 Let us have a quick look at them and its specifications and dimensions through the review of Ford F Series Super Duty 2017. The interior of Ford F Series Super Duty 2017 has a great similarity with the recently shared F-150. I take this as a positive sign as this includes the wide range of improvements that we saw in sibling. The low sheen materials keep track over a convenient daytime driving while the latest SYNC technology, TFT display and ergonomic placement of switches makes it tech oriented. It isn’t like everything has been copied; the model also has a few inclusions of its own. This includes second glove box finished in aluminum trim with a ‘Super Duty’ Logo over it. The trailer brake controller and optional auxiliary switches are still a part; however the later is now relocated to the overhead console. There are in all seven cameras in the interior of Ford F Series Super Duty 2017 keeping a track over each corner. This gets accompanied further by a more intuitive interface that will make your experience far better than rest in the segment. Unlike the interior the exterior of Ford F Series Super Duty 2017 at first sight looks totally different, especially the front fascia but a closer look will unveil resemblances form the 1998 model. Let us begin with the front end, where a massive twin-bar grille sits proudly amidst two side vents that are integrated in the headlights. Beneath this setup is the bumper that has closed-loop tow hooks. The model is also equipped with side LED spotlights that are housed in the side mirrors while the cargo box also gets the treat through the LED lights. Complementing the front fascia, rear end comes with tall tail lights that follow the accent lines; the one integrated in tailgate. The bumper comes with an integrated trailer wiring and harness. 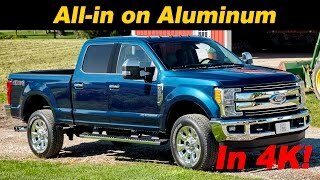 In all I would say the exterior of Ford F Series Super Duty 2017 is innovative, classy and powerful. Beneath the hood of Ford F Series Super Duty 2017 will be 6.2 liter V8 gasoline, 6.7 Liter Power Stroke V8 and 6.8 Liter Gasoline V10 engines. 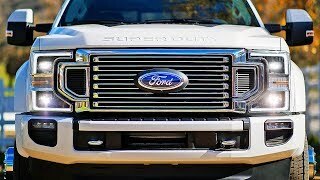 The power figures and the performance figures of Ford F Series Super Duty 2017 are still not shared but we expect a good hike in figures, maybe this is why the company kept the figures hidden.